Magneti Marelli’s ranges of GDI injectors are already fitted on 4, 6, and 12-cylinder engines sold on the European, North and South American and Asian markets. They run on lead-free gasoline as well as on ethanol and methanol in various concentrations. They are available in two different sizes: short for standard side-mounted assemblies and long for deep-housing assemblies. A special solution patented by Magneti Marelli allows sprays to be created in which the length ratios of the outflow flows can be defined for each single hole such as to obtain sprays that perfectly adapt to the engine combustion chambers, minimizing tip deposits. Moreover, Magneti Marelli patented an innovative system that allows the production of a monolithic pin equipped with anti-bouncing system that prevents post-injections, minimizes noise, prolongs resistance time and ensures multi-injections with waiting times of less than 200 us between two drives. The magnetic circuit avails itself of high-performance materials and a design that minimizes circuit length, in order to guarantee a dynamic operating range with the highest performances available on the market. A backlash recovery system incorporated in the injector makes it possible to accept alignment errors between the engine head and the fuel rail cup obtainable with traditional machining. The injector also has a built-in elastic element that ensures proper fixing and positioning on the engine with no need for additional components on the engine assembly lines. 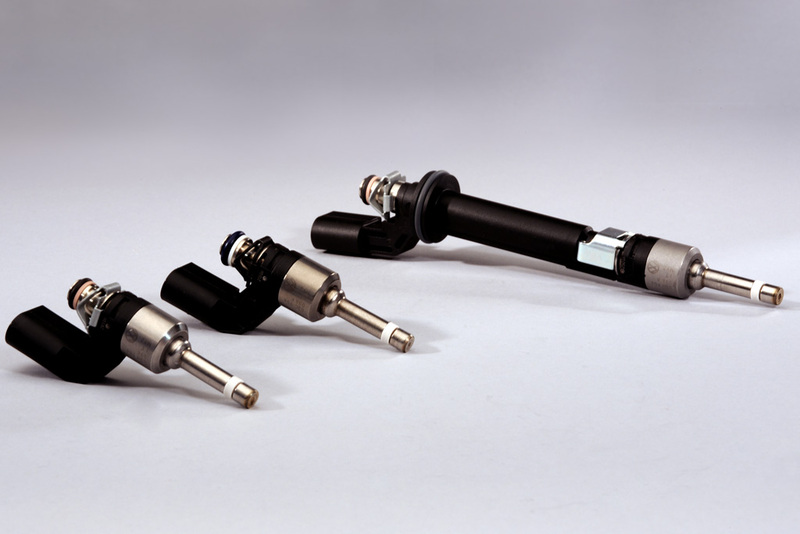 The Magneti Marelli laboratories are currently developing the new generations of injectors aimed at increasing the current working pressures from 20 MPa (200 bar) to 35 MPa (350 bar) and 50 MPa (500 bar); thanks to a specific self-adaptive control software (DRE), it will be possible todose minimum injections > 0.5 mg per hit.